Sometimes companies reach the point where they can't make any significant increases on the first 3 organic growth streams which puts them in the position of needing to expand to another product or brand. That's when they are faced with the decision of doing everything in house and developing something new or to use the 5th way to grow revenue: manufacture it. No I don't mean manufacture as in build a new plant, but rather manufacture the revenue growth by looking for an acquisition target (quasi-engineered). When acquisitions are done right they can provide higher revenue as well as more profits due to the reduction of duplicate costs. For more information on the 5 ways companies can grow check out this post. Earnings per share should also grow over time if a company is able to consistently grow its revenue. Companies generally have 3 ways to grow their earnings per share. If a company does all 3 of these together then earnings per share will show a nice upward growth trend. Combine that with a culture of rewarding owners with higher dividends and you have a great dividend growth investment candidate. I've already covered revenue growth so let's move on to decreasing costs. Decreasing costs is essentially a way that companies can reach higher productivity. As a quick example if Company A and Company B make competing products in the lucrative widget industry of widget making. Company A can make 1,000 widgets at a cost of $1,000,000 and Company B can make 1,000 widgets at a cost of $900,000. If the sale price is the same and everything else being equal, then Company B would make a more attractive investment since they can generate most product for less cost. However, I consider decreasing costs as quasi-engineered growth since there's a natural limit to how much costs can be reduced before hurting the quality of the product or the productivity of the company. I think we all agree that decreasing shares outstanding is a good thing for companies to do since it increases the ownership stake of the remaining shareholders. However, when it comes to how companies get their growth this is the most engineered form and something that needs to be watched closely. Every company has a story to tell and they tell that story through their financial statements and press releases. Press releases are like the trailer for a new movie. You get the general idea of how things are going and some highlights of the big scenes, but much of the details are missing. It's not until you go and see the full length version, the financial statements, that you find out all of the details that go into that story. The numbers that a company reports tell a story and you need to make sure you're ignoring the bias from management. Executives of a company don't want to paint a negative picture of the company so they'll only highlight the numbers that shows them in a positive light. Even though it takes more time than just looking at the numbers as reported, this is one of the most crucial steps in determining how a company is generating its growth. Essentially is the growth for real or is it engineered. You need to look beyond the headlines to figure this out. Let's take a look at one company's numbers and the wildly different stories they tell. 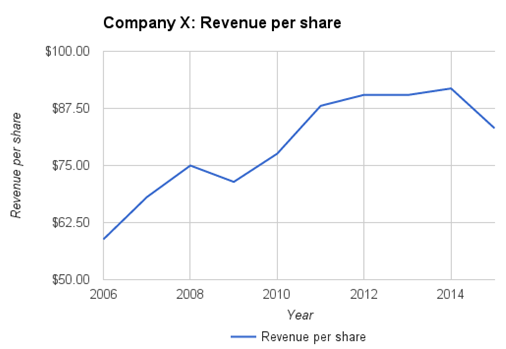 Revenue per share hasn't grown every year; however, the long term trend is for rising values. There's a nice trend of growing values on a per share basis. However, as I mentioned earlier it's important to compare the per share growth to the gross values of the same metrics to make sure that share reduction isn't generating the bulk of the growth. Let's look at the gross values of revenue to see if there's a different story to be told. The gross revenues tell a completely different story from the per share narrative. From 2006 to 2015 the gross revenues have decreased by over 10% while revenue per share has increased by over 40%. I think it's pretty clear that we have different story lines being told to us. In one case the company has shrunk by over 10% over the last 10 years and in the other case the company is showing an improvement by over 40%. So which one do you believe? I personally don't look at the per share values to determine if there's real growth going on because it gets skewed too much by share count reduction. 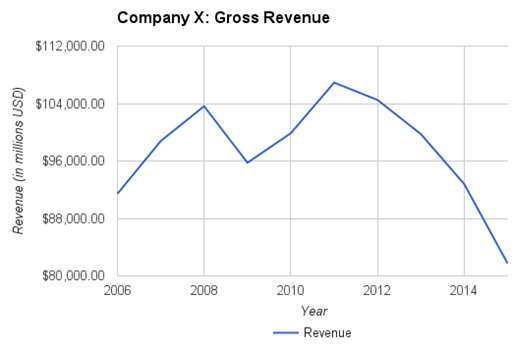 The gross revenues show the actual growth of the company, or in this case decline of the company. If you are wondering, the company we looked at above of course is International Business Machines (IBM). This doesn't necessarily cross this company off the list because all we've looked at is two versions of the same metric: revenue and revenue per share. This is just one piece of the puzzle and there's plenty of other things to take into consideration before making an investment decision. When you look at other pieces of information you get even more stories told to you. This company is transitioning into different product/service lines which shows up elsewhere in the financial statements. Despite a 10% decline in revenue they've actually seen a 20% and 39% increase in the gross free cash flow and net income, respectively. That speaks to the improvement in margins and efficiency of a dollar through the company which is always a good. Don't get lured into making investment decisions based on the headline numbers that a company reports because sometimes they can tell very different versions of the same story. Always put in the time to figure out the story that's actually being told, rather than the story being told to you. DGI Note: I wanted to mention that revenue growth is indeed helpful in evaluating good investments. I also agree that digging further, and taking into consideration as many data points as possible, is extremely important for the investment decision. For example, revenue growth for the sake of revenue growth could be dangerous as well. You want revenue growth which also adds to the bottom line. For example, retailers Kohl's (KSS) has increased revenues over the past decade from $15.50 billion in 2006 to $19.2 billion in 2015, while net income dropped from $1.1 billion all the way to $673 million in 2015. While IBM is an example of a company that has had no revenue growth, there have been companies in the defense industry, which have experienced flat revenues or declines in overall revenues, but were great investments. These companies have managed to deliver earnings per share growth, dividend growth and high total returns to shareholders, through buybacks. A few examples include Northrop Grumman (NOC), Raytheon (RTN). As we saw in the example with Exxon in the 1980s and 1990s, the company barely grew total revenues for almost 20 years. At the same time, the stock performed wonderfully for shareholders. All of this means that revenue growth is just one item to consider in overall analysis of the company. You need to take a look at valuation, trends in earnings per share, dividends per share and you need to evaluate management’s ability to allocate capital wisely.